This dog leash with a kushee on the collar and a grip on the leash portion for gaining easy control of your dog. This dog leash and collar all-in-one will help simplify dog leashing tasks, save time, and minimize frustrations with ordinary leashes and collars. This amazing leash creates simplicity for most dog owners on a daily basis.If you wish for more control of your dog during training, walking, running this could be a great change for you and your dog.This leash will help with dogs that like to tug on the leash.This leash is more beneficial if used above a regular flat collar. 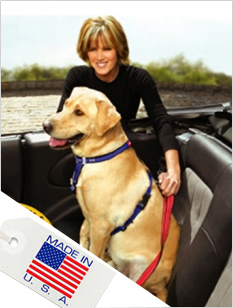 When placed on the dog correctly, it should help with pulling, if not try our Zipp-n-Go with a DoggBoss Handle or call us for more help.The collar portion self adjusts to any dog and size.There is no bolt snap to hassle with, it’s very humane because it’s flat.It helps prevent coughing/ gagging like a regular flat or choke collars but yet gives more control.It does not put direct pressure on the throat when the dog is pulling on the leash or during corrections by the dog owner during training or exercising. 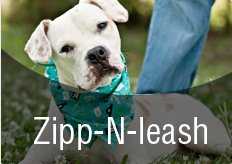 The Zipp-n-Go helps to prevent a dog from backing out of their collar while being leashed, walked or trained.The Zipp-n-Go also comes with a 1 inch wide, very soft handle for comfort.It's the very first zipping dog leash and is easy to use. We hope you love it and your dog will too. If not please send it back and we will refund your money. For any queries on its use, Give Us a Call. (PATENT PENDING) Check out the reviews tab to see how a Zipp-n-Go dog training with Kushee collar leash can help you with your dog or puppy. I've been working with both the Dogg Boss and his leashes with my two boxers for 5 sessions now and I would not go back to another leash. It's comfortable for the dogs and the foam grips are great for my hands and control. Love these leashes. I have 2 large dogs that are a) hard to walk due to their pulling and. b) one of them had a habit of stopping short and ducking his head to slip out of his collar. This leash/collar has extra rubber bumpers on it so that he cannot slip out. Also it tightens when he pulls but the rubber is gentler on him. It works great on both of them. Love it. Going to order another one. Only hope i get get next one more quickly. We did a rescue dog 2 1/2 years ago, and have used nothing but a pinch collar on her from day one. I have noticed for the past year that she is gentle, and rarely pulls while on lead. So I bought this new one, have used it for a week, and will never again need the pinch collar. I use to wrestle with my Min. Pin. to put on her collar and leash. I no longer have that problem. It goes on quickly, and I have much more control over her with the added protection around her neck. The only con is her neck is so small I have to re-position the padding around her neck sometimes. Nevertheless, after 5 collars and 4 different leashes, this is hands down the best one. Totally enjoy walking my dog...NOW. Was introduced to the zipp-n-go when Jeff started training my Dalmatian puppy. I HAD to have one when I saw Jeff place the collar around my dogs neck and within minutes had total control over him with little effort. It is an easy on/off, can't slip off his neck, he can't back out of it and HE controls how tight it becomes when he pulls which makes him NOT want to pull! Walking him is so much easier and pleasant now. My arm is not pulled out of its socket and I can incorporate training on our walks with a quick and gentle correction jerk of the leash. This simple design leash is the best leash I have ever owned, and has made life a whole lot better! We have one of those dogs whose head is about the same size as her neck and she can back up and slip out of most collars. This solves the problem on walks-it is easy to slip on her but she can't slip out of it and the quality is great.We also purchased the retractable version and it is the same high quality. Been a dog owner nearly 30 years- best leash ever! I met the inventor, Jeff when I hired him to train my dog. He was using this leash which is simple in design but extremely effective. My dog moves with me, doesn't yank my arm off and doesn't choke. I have used pinch collars in the past...out of desperation...and am not a fan of how aggressive they are. The zipp-n-go accomplishes the same thing without harming my boy! A totally awesome feature completely unrelated to my dog?? -- the ease with which I can leash up my dog. I am a new mom and often have an infant in arms when I need to take Miller out. It's easy. No hooks, snaps,etc--- it works like a charm. One-armed leashing is a cinch. I would recommend this to anyone. Our Alapaha Bulldog puppy is responding great to her Zipp-n-Go Leash! After picking up a Zipp-n-Go Leash at the Atlanta Pet Expo, our puppy, Cookie, has been getting better and better with each walk. Before, we were using a traditional leash attached to a collar, and it was a game for her to pull and pull. The Zipp-n-Go Leash is making all aspects of training much more effective. I've used the Zipp & Go Leashes for my training classes, I teach basic and advanced group classes, and they work great for all dogs! I also love them for my own dogs when we are performing at our shows. The non-pull/choke feature is great, since they are so excited about performing their disc and other tricks and my assistants have no trouble unclipping the leashes, so the dogs come running out to perform with no hesitation from the old style clip leashes or slip leads. I can't say enough about them! Thanks Dogg Boss for making my shows run smoother and helping my clients enjoy walking their dogs! Gail & the Dynamo Dogs! I bought 2 zip-n- go leashes over the weekend and it has help me keep better control over my two dogs. I recommend this for everyone. I have two Yorkies and this leash makes it so easy to take them for a walk. I used to have to put harnesses on them, cinch the harness up and then attach the leash. This leash is so easy. Just slip it on and go and I don't have to worry about their trachea. Great product!! Zipp-n-Go is the way to GO! Genius creation. The Zipp-n-Go is the best leash money can buy. It's so easy to put on and take off and it works great for training. I have a small yorkie and now when we go on our walks she doesn't get choked and cough like she would with a regular leash. I highly recommend this leash to all the dog lovers out there. The Zipp-n-go leash is a game changer. It's is so easy to put on and take off - literally, a slip of the leash. And once on it provides a secure and relaxed fit. When you need it for a correction, with a quick zip, you are back in control. The evenness of the pressure during a correction is great, too, instead of yanking on one side of your dog's neck or the other like you get with a traditional collar and leash. You'll really notice the difference! Beginning with the easy on/off to the the control you have without choking your dog, this leash is the most creative, practical leash I have seen/used. My husband is limited to using one hand and this is so simple for him. We are using this for training and corrections are easy and humane. When using to walk our dogs we no longer have to worry about them slipping out of their collars. This leash has it all. I would strongly recommend you give it a try. Regain control and enjoy your walks! I have a 60 pound Boxer that is extremely hyper and has a strong alpha drive. She pulled me on walks with every leash we tried until I was introduced to the Zipip-n-Go leash. It is extremely convenient to use and is specifically made so that it will not choke your dog. Our walks are much less stressful because I feel like I am much more in control by using this leash. I would definitely recommend this product to other dog owners! This Zippngo leash is absolutely perfect!! We have a very young puppy and a traditional leash was so difficult to work with. By the time we could get it secured to her collar she was having an accident in the house. With this leash we are able to get it over her neck very quickly and get her right out the back door. Saves us so much time,aggravation and doggy frustration.It has also helped tremendously with her training.With its light weight we can keep it on her in the house. This makes correcting her behaviour so much easier. My wife and I have tried all kinds of leashes and this one is the best by far. We had problems with our dog slipping out of his collar on walks and now we don't have to worry about that (which is good since we now have a 5 month old baby and can't drop everything to run out into traffic to catch our dog). This is a great leash for training too. I recommend this leash to everyone. Love this leash. It takes very little effort to correct the dog. My dog has made great improvement in the few days I have had it. I recommend this leash to everyone. The Zipp-n-go has changed my life! I really like the Zipp n go for my dog. Being that I have weak arm muscles due to Muscular Dystrophy and I’m in a wheelchair, I have to rely on my wheelchair to correct my dog or keep him from pulling when he is excited or just wants to lead the way. The Slip n go has changed all of that for me. I can correct him with the smallest tug and even hold the leash with one finger. I recommend anyone to use this product and give it 5 stars.